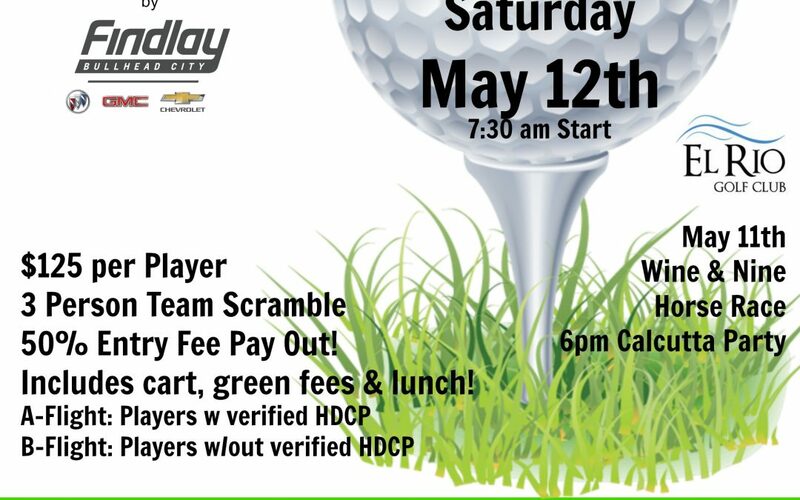 BULLHEAD CITY–It’s time to tee up for a good cause! Register for the annual Boy’s and Girl’s Club of the Colorado River’s CHIP in Fore Kids Golf Tournament scheduled for May 12 at El Rio Golf Club in Fort Mohave and help local kids by sponsoring one of the tees. The tee sponsor is $100 per business/individual. 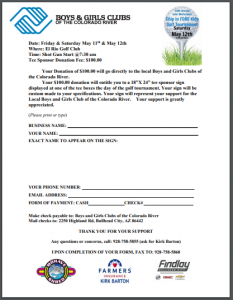 All printing is handled the Boys and Girls Club of the Colorado River.The fee to participate in the golf tournament is $125 per player and includes a three person team scramble, cart and green fees. There is a 50 percent entry fee pay out. Those wanting to be a sponsor are asked to have their payment and forms in by Wednesday, May 9 at noon. Forms can be mailed to admin@clubriver.org.